"Ah Yes", tin foil hat King. Amazes me how these criminally insane people get to run our country. Noted and signed. Thanks, Judy. This self-serving CRETIN needs to be voted OUT!!!!!!!! S+N Now we need an amendment to get rid of Steven King. Already signed this one. Thanks for sharing, Judy. 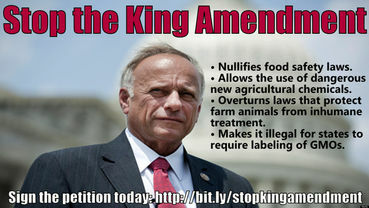 He needs to be voted out so he doesn't harm animals anymore. Signed, noted and commented. Thank you for keeping this out here so everyone can sign. Thanks Judy for providing the link to the petition. Signed and noted. Signed & noted. Thank you, Judy. P.S. Whatever you do, DO NOT SIGN the petition that pops up after from "Coloradans for Responsible Fracking." Need I say more? The sad truth is that so many of the "elected" representatives in the farm belt are supporting all of this nonsense because huge corporations are funneling massive infusions into their re-election coffers. So long as elections can be bought, sane people have a hard slog uphill. Noted, signed the petition and shared on Facebook. Thanks for posting. Noted and signed. Thank you. Noted & Signed. Thanks Judy.